LOTS OF ROOM FOR MUSHROOMS. With some helpful tips from wild mushroom expert Tavis Lynch, you could find some of these bad boys around the Chippewa Valley: The ever-popular morel (above), the chanterelle (the yellow one below), and the oyster (below). Use this guide to hunt for yours responsibly and deliciously! April showers bring May … mushrooms? It’s true. As the weather warms and the snow melts, hundreds of fungi are preparing to break through the forest floor. For Tavis Lynch, a Wisconsin-based mycologist and mushroom farmer, spring is foraging season. Tavis comes from a long line of fungi fanatics. His father could identify edible mushrooms before kindergarten, and he taught Tavis and his siblings to do the same. Now, Tavis continues the family tradition, taking his nephews on foraging expeditions. With a degree in mycology, teaching experience, and Tavis’s Wild and Exotic Mushrooms – a mushroom farm, wild mushroom supplier, and informational resource – Tavis has evolved into an expert in his own right. Lucky for us amateurs, you don’t need decades of experience or a college degree to find edible mushrooms in the wild. In fact, you might have some growing in your own backyard. 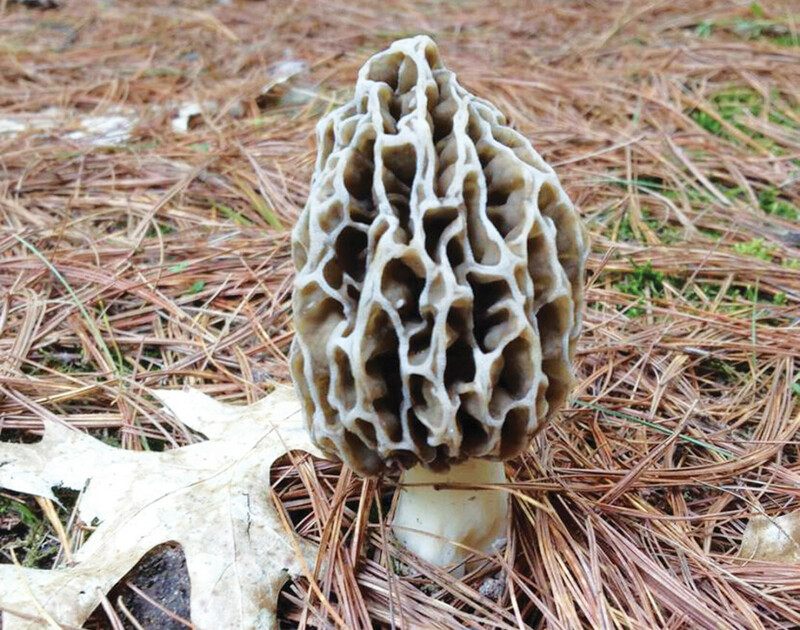 We talked to Tavis to get the how, when, and where of mushroom hunting in the Chippewa Valley. 300 edible mushrooms thrive in Wisconsin. Tavis has tried 160 of them, but says that most aren’t worth your while. These are the six most popular species you can find around Eau Claire. By far the most popular mushroom among fungi fanatics, the morel can be found beginning in early- to mid-May near ash, elm, oak, and apple trees. Its unique sponge-like cap make it one of the easiest mushrooms to identify. Oyster mushrooms grow in large clusters on living or decaying trees – aspen in the spring and maple in the fall. They are distinguished by their white to light brown color and flat, shell-like appearance and are often used in Asian recipes. 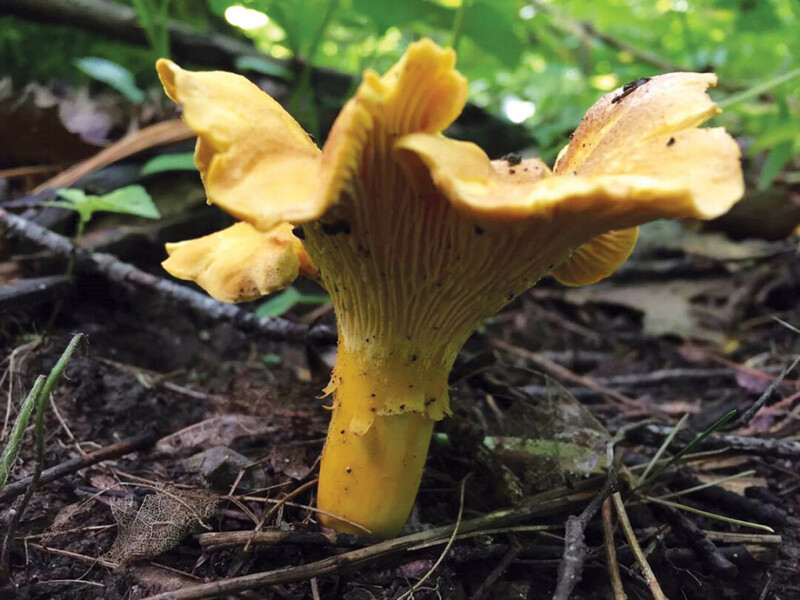 Marked by their yellow-orange color and extended gills, these mild mushrooms thrive near balsam firs, oak, and pine trees and are abundant in the summer. Considered a gourmet mushroom, chanterelles smell at once fruity and earthy and have a complex, rich flavor. Perhaps the most gastronomically unique mushroom in the Valley, Lobster Mushrooms have a crunchy, water-chestnut-like texture and mild seafood flavor. Their fanned heads and bright red-orange color closely resemble a lobster tail. They can be found in the summer growing next to oak and pine trees. Hint: Lobster mushrooms are inedible until they are attacked and parasitized by mold that covers the fruit with a bright orange skin, similar to a lobster’s. Abundant in spring and summer, these common mushrooms resemble huge yellow or light brown balls and when cut open reveal a solid interior. Giant Puffballs are one of few endemic mushrooms that do not require a tree to grow and can be found in any open grassy area. Don’t eat them if they’re white! 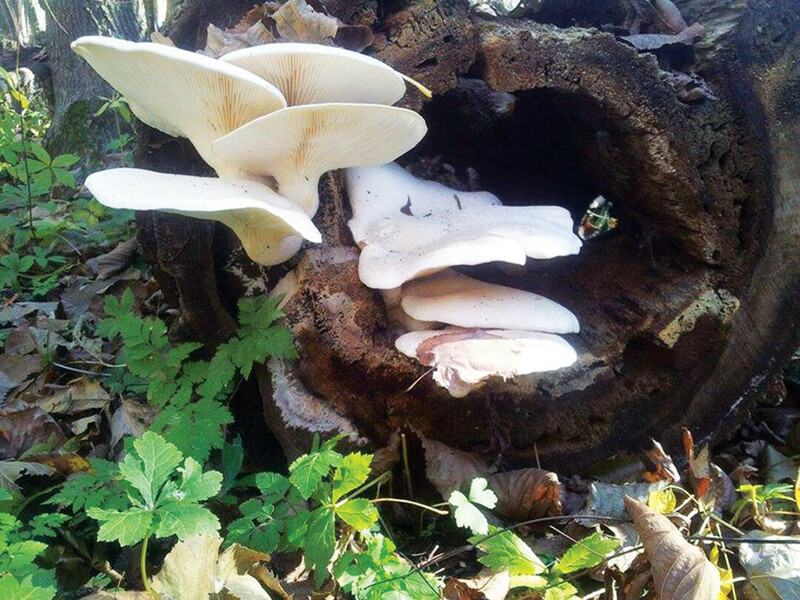 White mushrooms are mature and can cause stomach problems. Commonly known as Hen-of-the-Woods, Maitakes fruit in the fall and are exclusive to oak trees. They grow in clusters of curled, grey-brown caps at the base of their host trees. Their delicate taste and texture make them perfect for simple dishes. 2. Prepare for the day. Bring a basket or bag. Dress to be out in the woods: wear good shoes, don’t wear skirts or heels. 3. Stop. Get low and scan. Instead of walking up hills, stop at the bottom and look up. You’ll save a lot of energy and find more mushrooms. 4. Bring little kids. Having a set of eyes low to the ground is invaluable, watching your kids experience the thrill of their first foraging trip is priceless. 5. Watch the weather, day-to-day and overall. Mushrooms generally fruit in the three-day window after a rain. They are more likely to be found low on hills in wet years and high on hills in dry years. 1. Never eat little brown mushrooms. They all look alike and many are poisonous, so avoid them altogether. 2. Stick to what you know. Never eat a mushroom unless you can identify it with 100% certainty. 3. Don’t experiment. Just like wild plants, wild mushrooms can be dangerous. If it’s classified as inedible – even if it’s not considered poisonous – don’t eat it. Interested in planning your own foraging trip but want more information first? Tavis is teaching Mushrooms 101 at the Menomonie Market Food Co-op April 17 and 18. This two-day, $25 mushroom hunting crash course will teach you everything you need to know for a successful expedition. Topics include mushroom identification, where and when to look, culinary preparation, long-term storage, and poisonous mushrooms. Can’t make it in April? Fret not, Tavis will return to Menomonie in May for spring edibles class. He welcomes any questions via e-mail (mushroomtavis@hotmail.com) or on his Facebook page, Tavis’s Wild and Exotic Mushrooms.